A must watch for any CF paediatric parent. Different doctors give different advice. So do different clinics. There’s no getting around it. We do not have an agreement on modes and models of care from one country to the next or even one clinic to the next. As parents we can’t avoid the responsibility of making the most informed decisions possible, which is why we all need to seek out information and experiences beyond our own as much as we can. The real reason is not just hearing other doctors speak but also listening to other parents and children with CF. These are the people on the battlegrounds at the forefront of day-to-day care of this disease, just as we are. The CFRI is a terrific organisation that offers loads of resources and they recently had a paediatric conference on “Tools to help your CF child thrive” – this is the first presentation from that series. I’m going to post them one by one with a short summary over the next few weeks. This video with Jeff Wine PhD explores how general levels of health have been maintained amongst healthy CF patients and can we generalise from those experiences? What can we learn from them? 4. Chronic infections can be prevented with available treatments. 3. Bacteria are found in the mucous not in the airway surface (research shows that bacteria are more than 5 microns away from the airway surface) which means that if you get the mucous out of the lung, the bacteria comes with it! 4. Bacterial infections are heterogeneous. They (usually) start high and move low. Which potentially means – infections in the nasal passages get to the airways. He contends that we need to keep the nasal passages clean as a cornerstone of CF care. 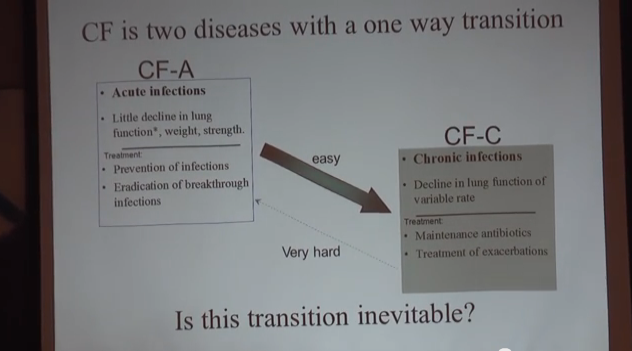 Peter Wang – Stanford Otolaryngologist gave a talk some time ago at CFRI on “How to keep the nasal passages clean” and Jess Wine contends that this should be the first most important aspect of any CF care. The nose turns out to be critical and in the early stages of life, this is the trajectory through which bacteria must pass. The nose is designed to ensure that bacteria doesn’t get passed – its the mucous in the nose that traps the bacteria – so you don’t want to let polyps grow in the nose causing the child to breathe through the mouth and you don’t want to let bacteria linger in the nose. 5. Psuedomonas evolves in the airways if its not eradicated from the lung – don’t let an infection linger, get rid of it as quickly as you can. He presents findings about how Psuedomonas (left to colonise in the lung) eventually and inevitably evolves from the non-mucoid form (which can be eradicated) to the mucoid form (which presents as a chronic infection). 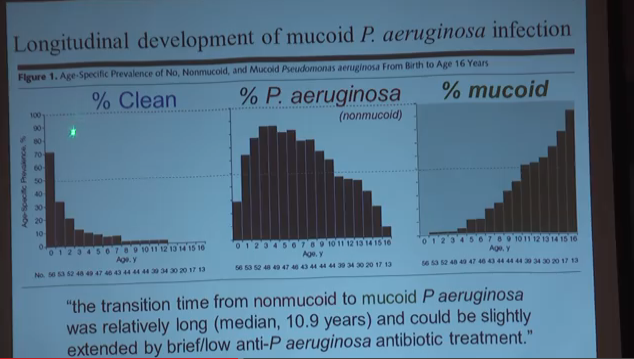 Jeff presents findings from an American CF clinic which shows that the proportion of psuedomonas that is non-mucoid gradually decreases as children reach 12 years of age which corresponds with an increase in mucoid psuedomonas. Research showed that the transition time from mucoid to non-mucoid psuedomonas was relatively long (media 10.9 years) and could be slightly extended by brief low doses of anti-psuedomonas antibiotic treatment. Jeff contends that it can be greatly extended by long and high doses of anti-psuedomonas treatment which is what we should be doing. 7. Infection / inflammation leads to bronchiectasis and bronchiectasis increases infections (bronchiectasis is where the cartilage in the airways start to dissolve). How do we optimise existing treatments to prevent CF lung disease? Everybody agrees that this is key. Exercise. Exercise. Exercise. And do your physio. Every day. Use hypertonic saline, use Pulmozyne, do whatever you can to get rid of that mucus. Bacteria doesn’t live in the surface of the airways, it lives in the mucus. Antibiotic resistance is a major problem and therefore there has been resistance to the use of antibiotics. When it comes to CF this view is backwards. The early methods of treating lung disease led to bacterial resistance because they didn’t get rid of the bacteria in people’s lungs. Bacteria grow exponentially and according to Jeff Wine’s team’s clinical research, whatever bacteria you start with in the lungs, you’ll have a million times that, 20 days later. Antibiotics used early help avoid antibiotic resistance because there are then vastly fewer bacteria and so much less chance of encountering resistant strains. It’s very hard to detect the growth of bacteria in the early stages when you could do most good. Bacteria evolve their resistance in many ways and resistance spreads quickly among a population of bacteria. If you use multiple antibiotics you clear infections and reduce the chances of producing antibiotic resistance. This is even better if you start early while the bacteria population is small, this means starting early. So who is using this effective strategy? AIDS: Whilst this multi-antibiotic treatment approach has not yet been taken up in CF treatment circles yet, AIDS have been using a multi- anti-microbial strategy for some years. Each class of anti-HIV drugs blocks the virus in different ways. AIDS treatment believes its best to combine at least three drugs from 2 classes to avoid creating strains of HIV that are immune to single drugs. This is now the standard treatment of care for AIDS. (Mayo Clinic). Tuberculosis: Multi-drug resistant and extensively drug resistant (XDR) tuberculosis are generally thought to have high mortality rates but in many cases, can be treated. The recommended regime is the combination of at least 4 drugs, which the mycobacterium tuberculosis is likely to be susceptible. (Camerinero, Lancet Infect Dis, 2010, 10, 621-629). Your own lungs are producing lots of anti-microbial substances all the time. They’re not waiting until you’re chronically infected; they’re producing them all the time. What antibiotics should you use? This is where you need to consult with your CF doctor. 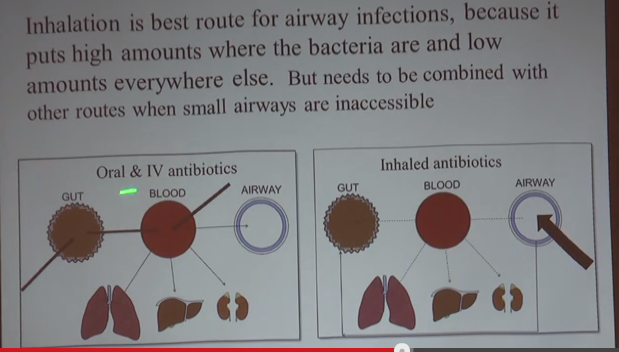 Inhaled antibiotics are the best route for airways infections because inhalation puts high amounts where the bacteria are and low amounts everywhere else (your blood, lungs and gut). Especially in the early stages. However it does need to be combined with other routes when the small airways are inaccessible. None of the major points he outlines seem to conflict in any significant way with the philosophy of our clinic. I’m also grateful that with the introduction of the Parents Advisory Committee set up by the CF care team to work in partnership with them, that we are moving towards a parent-partner approach where we can discuss alternative viewpoints and explore other routes of enquiry. Jeff’s presentation raises some provocative thought-starters for discussion; these ‘provocations’ can be really useful for initiating discussion around what else we could be doing or trying. There may be reasons why we don’t, we may be doing most of it already. Either way, as part of the PAC we’re always looking for the kinds of topics we could be exploring at Information Nights. If people are interested in this, let us know and we can ask the CF care team to unpack some of the topics from this latest CFRI paediatric information evening, at our next information evening (there are presentations on nutrition, lung health, the teenage years). Should we be going straight onto inhaled antibiotics (rather than oral) at the first sign of bacteria? How regularly should we be sampling sputum to ensure we detect bacteria early? Should we be considering combination-inhaled antibiotics after a cold to stop the follow on bacteria that often follows a cold with CF patients? If we’re missing the anti-microbial elements of our airways, can we replace them proactively? The Danish protocol for treatimg Achromobacter is inhaled ceftazadime + oral ciprofloxacin early to eradicate the bacteria. They are aggressive in their treatment and are putting together case studies to support this method of treatment. What can we learn from this?